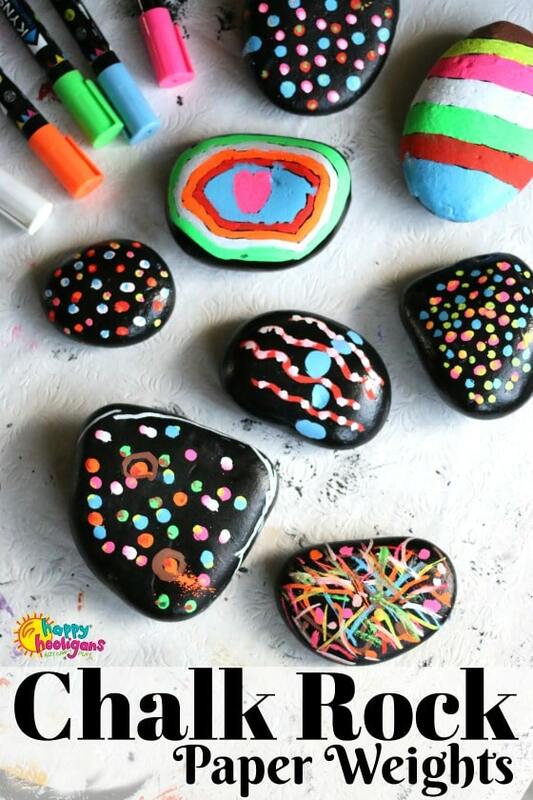 Kids can make these vibrant chalk rock paperweights with smooth beach stones and liquid chalk markers. 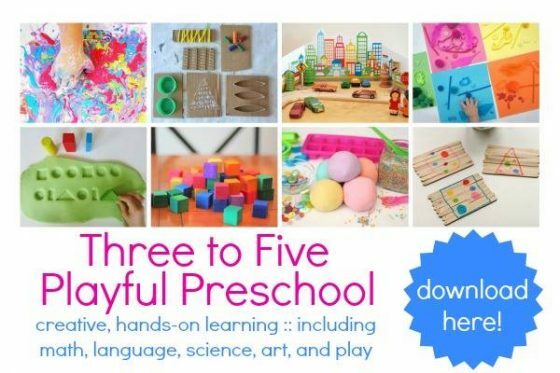 It’s a fun art activity for kids of all ages, and makes a terrific homemade gift for kids to make for friends, teachers or parents. 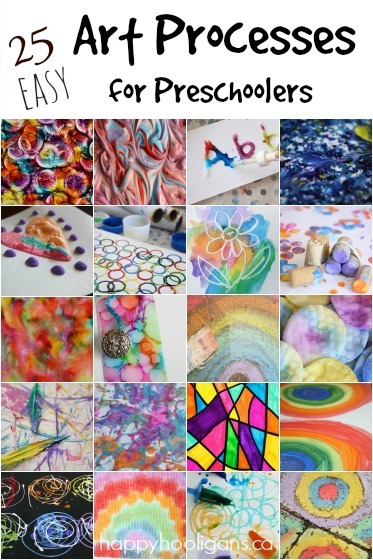 If you’re looking for cool ways to use liquid chalk markers, I have some fun ideas, starting with these awesome paperweights that we made in my home daycare last week. 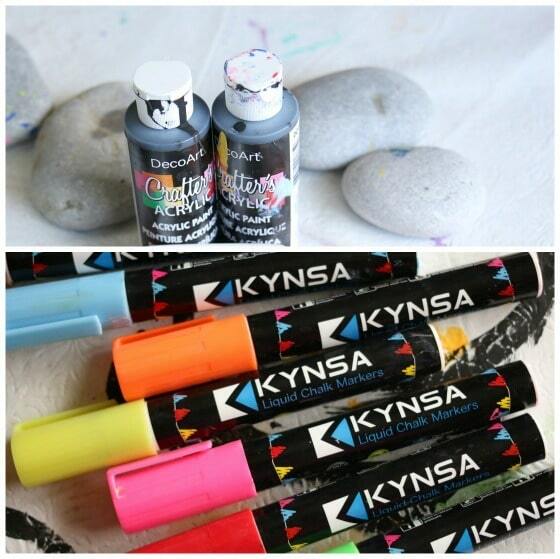 We’ve had a set of Kynsa Liquid Chalk Markers for ages, but mostly, they’ve been sitting in a jar in our craft room because I hadn’t gotten around to thinking up interesting ways for the kids to create art with them. Well, that all changed last week, when I got the idea to use our chalk markers to decorate some of the smooth stones that I brought home from the beach this summer. The hooligans love making homemade paperweights, and we’ve made some dandies over the years. I was looking at the black paperweight in this post the other day, and I wondered if we’d be able to make similar paperweights using our chalk markers. I ran the idea by the kids, who love any excuse to experiment with new art techniques, and they were super-excited. We prepped our beach stones one day, and then on our next day together, we busted out the liquid chalk markers. The liquid chalk markers glided over the painted rocks so smoothly, and the neon colours were so vibrant against the glossy, black stones. We were thrilled with the results, and the kids decorated a whole bunch to take home. 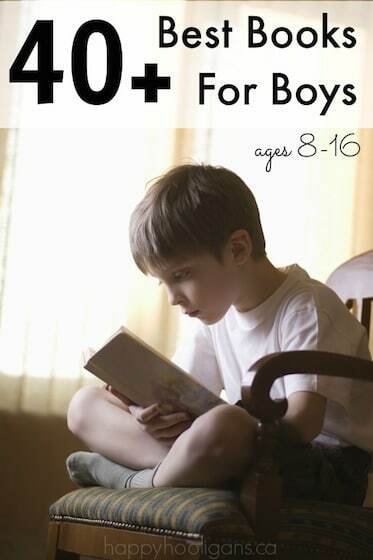 Some they’ll keep for themselves, and some they’ll give as gifts to their parents and friends. What are liquid chalk markers? If you’ve never heard of liquid chalk markers, let me explain what they are. Chalk markers are similar to paint pens. The ink goes on wet, but when liquid chalk ink dries, it looks like chalk. The great thing is: once it’s dry, unlike regular chalk, liquid chalk doesn’t smear or smudge. That means you can layer colours on top of each other and create some really cool designs. You can use liquid chalk on non-porous surfaces like glass, mirrors, stone, plastic, chalkboards and whiteboards, and the ink will wash off with water or a wet wipe. You can also use liquid chalk markers to make more permanent art on porous surfaces like paper, cardboard and wood. 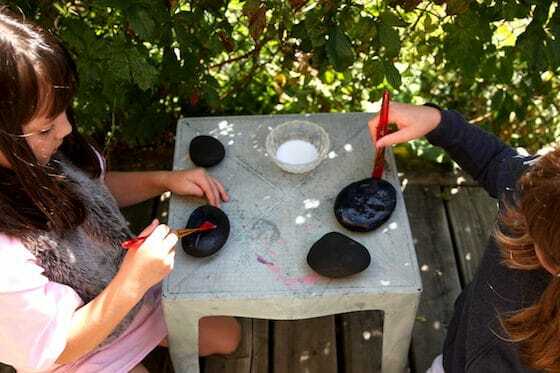 Liquid chalk markers are great for making signs and posters, labelling jars and bottles or just making unique art projects like our chalk rocks. We earn a commission from sales made via product links in this post. Wash your stones to remove any dirt, and let them dry. They’ll dry quickly in a sunny spot or you can speed up the process with the help of a hair dryer. 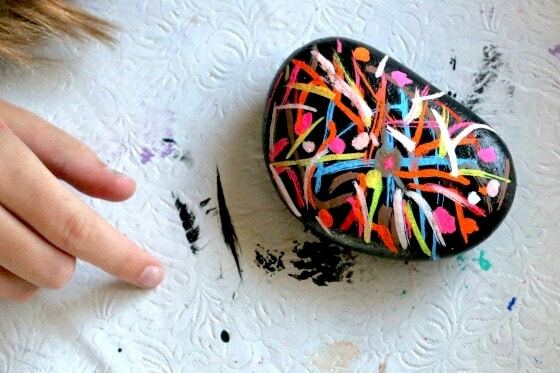 Once dry, have the kids cover the stones with a couple of coats of black acrylic craft paint. 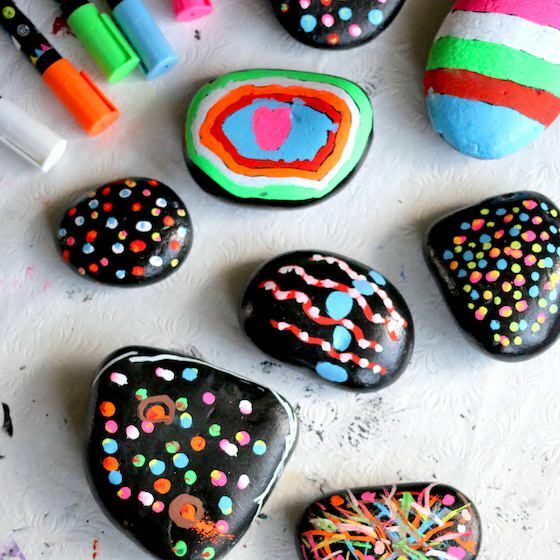 Note: you don’t have to paint your rocks first. The liquid chalk paint will adhere to unpainted stone, but we love how the ink really “pops” when you paint your rocks first. 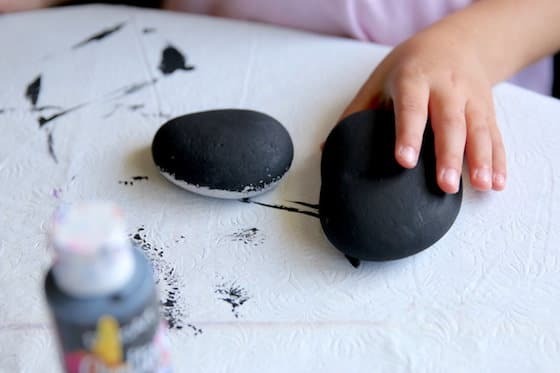 When your black paint is completely dry, (again, you can speed this step up with a hairdryer), have the kids give their rocks a bit of sheen by brushing on coat of clear craft varnish. We used a satin finish, but matte or gloss would work too. This gives the rocks a nice shiny finish and also protects the black paint from scratching or chipping over time. 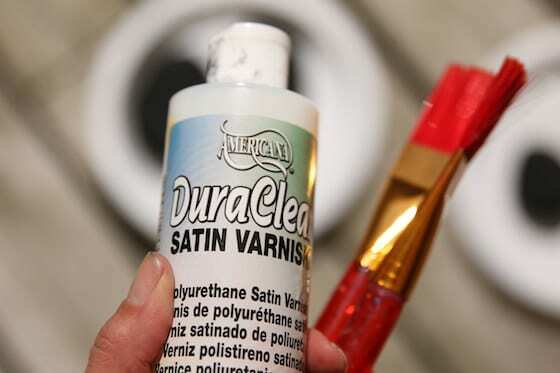 When your varnish is dry, it’s time to decorate with the liquid chalk markers. To get the liquid chalk flowing, shake the marker well and press the tip up and down a few times on a piece of paper. 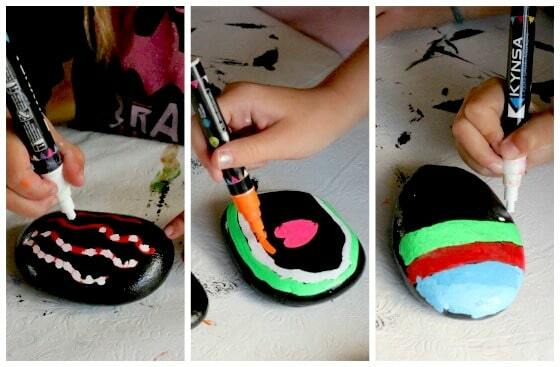 Then start decorating your rock. Make dots, squiggles, stripes or letters… whatever your heart desires. You can make solid blocks of colour or you can lay down colours on top of one another. 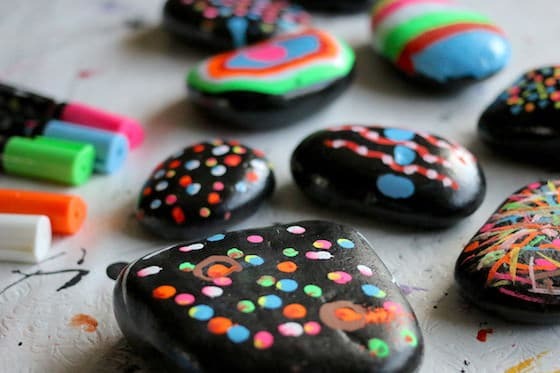 The hooligans had the most fun making multi-coloured dots, and stripes, but you can also write messages or your name on your rocks. What a great piece of homemade art to decorate a desk or dresser or to use as a paperweight! 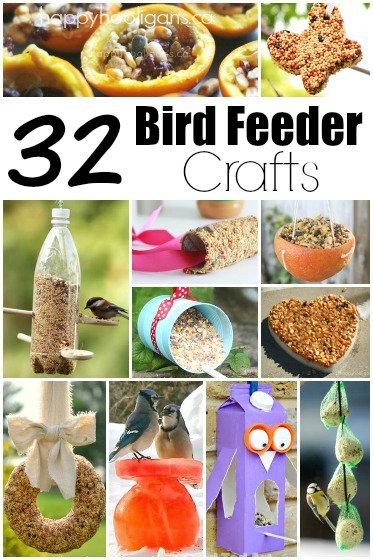 Keep your eye on the blog! We’ll be sharing more fun ways to use liquid chalk markers in the days to come. 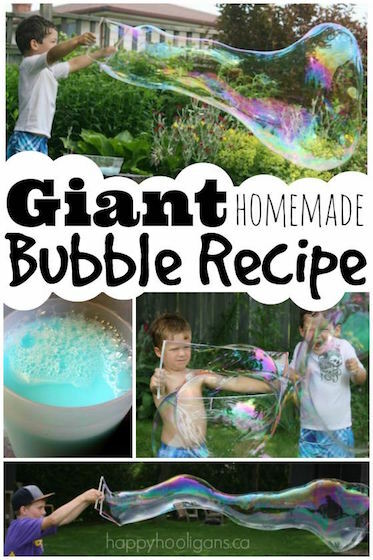 This looks like such a great project and we plan to try it. Just curious: Why varnish the rocks before adding the chalk markers? I’ve read elsewhere that the chalk markers wipe off of non porous surfaces. Thank you! Hi Jennifer! Thanks for asking. I’ve edited the post to clarify that the varnish simply gives the rocks a nice shiny finish and protects the black paint from scratching off.